How Many Louisiana Jobs Are Actually At Stake In Keystone Debate? : It's All Politics Momentum to push legislation approving the oil pipeline is getting a boost from the Dec. 6 Louisiana Senate runoff — even though the unbuilt portion of pipeline wouldn't run anywhere near the state. How Many Louisiana Jobs Are Actually At Stake In Keystone Debate? GOP Rep. Bill Cassidy and Democratic Sen. Mary Landrieu face off in a Dec. 6 Senate runoff. Both are pushing for legislation approving the remaining leg of the Keystone XL pipeline between Alberta, Canada, and Steele City, Neb. With the Louisiana Senate runoff driving votes in both chambers of Congress on the Keystone XL pipeline, here's a question: How many of those jobs will actually be in Louisiana? "I don't think it goes through that state," laughed Sean Sweeney, a Cornell University researcher who co-authored a 2012 report that questioned many of the justifications for the project. "This is less about jobs numbers than it is about advancing the fossil fuel industry's agenda." Keystone proponents include both Lousiana's incumbent Sen. Mary Landrieu and GOP challenger Rep. Bill Cassidy. Cassidy's bill passed the House easily on Friday. 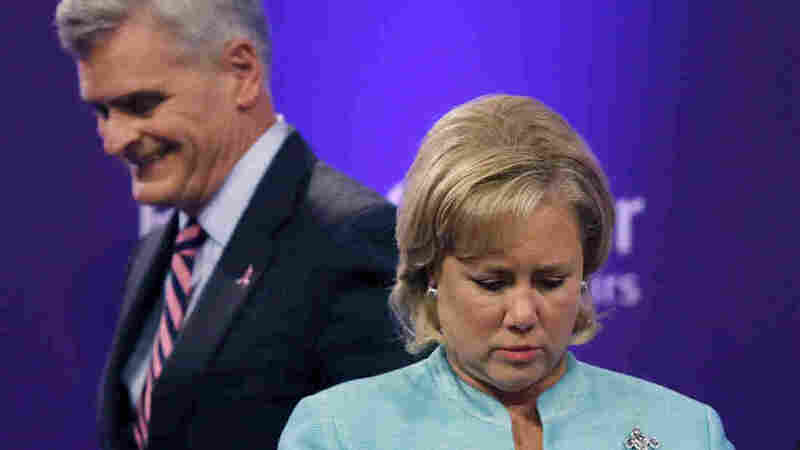 Landrieu's version is scheduled for a Senate vote Tuesday evening. Both argue that finishing the remaining 1,179-mile section of the pipeline from the oil sands of Alberta, Canada, to Steele City, Neb., will create 42,000 new jobs nationally. That figure is cited by the State Department, but it may be misleading out of context. The State Department's final environmental impact report earlier this year found the project would support 42,100 jobs, but it defined those jobs as lasting just one year. In other words, there would be only 21,050 jobs that last the entirety of the two-year construction period — and the majority of those are not construction jobs (there would be no more than 1,950 of those in each of the two years) but rather are "induced" by construction workers spending their earnings on goods and services in the area. As far as permanent jobs to operate the pipeline, there would be a total of 35 of those, according to the State Department report. Ian Goodman, an energy industry consultant who co-authored the Cornell report, said it's possible Louisiana residents could benefit. "Louisiana has a big oil and gas sector. It is conceivable that some of those pipeline workers could come from Louisiana," he said. That number, though, is not likely to be large, he said. "We're talking about tiny numbers here. ... A rounding-off error. You're not going to notice it," he said. So why, then, all the Louisiana-based attention on Keystone by and for Landrieu and Cassidy? "This is mostly symbolic," said Edward Chervenak, director of the Survey Research Center at the University of New Orleans. "This is an oil and gas state, so any vote that supports the industry would tend to go over well. They're both trying to show how much clout they have."